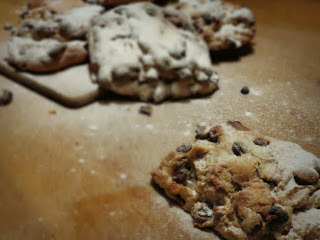 Now you have no excuse NOT to make stollen! 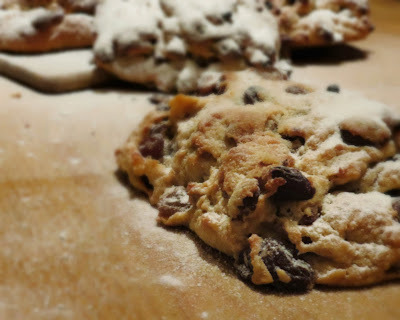 There are two schools of thought about Stollen, those pro-marzipan & those against. The Stollen my dad remembers his Grandma making (& that my mum has been trying to replicate for as long as I can remember) is firmly in the anti-marzipan camp. I love marzipan though so I grated a little into the mixture. This is mostly my mum's recipe so all praise goes out to her & there is always a lot of praise cause it is the best Stollen ever. Place the dried fruit, chopped peel, lemon juice & lemon zest into a container & cover with a mixture of the rum & orange juice. Cover & leave to soak for as long as possible. (If you get really cheap dried fruit they will soak up more of the liquid & it's actually better for this recipe than nice dried fruit). Mix the milk, sugar & yeast together & then set aside until frothy. Combine the flour, ground almonds, spices, butter, beaten egg & milk in a bowl along with the dried fruit & any liquid still remaining. Mix until it forms a dough (it'll be almost wet enough to be a batter at this point but that will make a really moist Stollen). Pre-heat the oven to Gas Mark 6/200 C. Kneed the dough again & divide into 6. Shape each into ovals about the thickness of your finger & double the length of your hand (if possible) & then fold the thin ends in, one over the other. Place onto lined baking sheets, cover with a wet tea towel & then allow to rise for a further 40-45 minutes. Bake until golden brown on the outside (about 15-25 minutes). If you don't use the marzipan maybe use all plain flour rather than the plain flour/wholemeal flour blend (the wholemeal flour was there to soak up a little extra moisture from the marzipan). having tried...unsuccessfully I might add...to make stolen, for the reasons you give. It was dried and over cooked on the outside while the centre was still undercooked, I think the idea of mini stollens is truly an inspiration! My question now is why no one has thought of it before, its such a brilliant solution to the problem of cooking enriched doughs and mini stollens are going to be so much easier to serve. I am printing out your recipe and off to try them today. Many thanks for such a great idea. These are almost too easy to serve, I think all the ones I made are gone...my brother ate...I think 3? I made some over the weekend and they were really good, a great recipe. I will be making lots more over the holidays as a result of strong 'requests' from my family. I'm really glad they worked for you! !